I failed. I admit it. I failed. I wanted to help franchisees in Atlanta, GA raise funds for Children’s Miracle Network and I did not hit my goal. The funds were to be used to buy equipment that would help in the rehabilitation process when a child loses a limb and needs to relearn how to move to get around, grab an object, or even dance. And, I failed to raise the money. What happened? Why did I not get the donations that would buy the tools kids needed to live full lives? I was focused on the wrong things. How many times have you had a goal and you failed to reach it? Every person fails to reach a goal. It is human nature to push for goals. We all want to win. But, somewhere along the line we miss the mark because we misspent our capital. You can spend money or time and effort to reach a goal. You can hire people to help you reach your goals. Money goes a long way to covering ground when you want to stand on the top of the mountain and declare a win. As for me, I was looking to raise funds, so it seemed to be counter productive to spend money to raise it. Just like in the model where money is spent to reach a goal, you can find others to help you. I spent my own time and effort to reach the goal and I didn’t look for others to help me. Get the message right. I had a lot of good ideas, but I was a mess when I was asked to explain the process of raising funds. Figure out, in the shortest way possible, the words to explain what you are doing, why, and where someone can help donate. Ask others to get the word out. I tried this, but didn’t get the power players involved to give it a strong push. I should have asked the executive team to mention it in their circles. Look for people who have the same goal. Reach out on social media and ask. Combining your goal with someone else’s goal doesn’t diminish your goal. It makes it bigger. If you can partner with someone to reach an even bigger goal, do it! Make it easy to find you. I set up a Facebook page and sent everyone there. I also set up a Twitter account. I was bad at keeping them updated. Spend time each day updating your social media accounts. Giving someone a consistent message shows them you are serious and organized. Celebrate the people who are helping you. Speak to them often and in front of the rest of the group. I should have thanked the group who joined my cause and asked for updates on who they talked to about it. That way, they would know I would ask and be open to having a discussion with someone new so they could talk with me about it. Reaching a goal is a tough proposition when you don’t create the plan. I didn’t plan well and I didn’t hit my goal. Save yourself from the same fate. Plan, follow up and implement changes to keep on track. The biggest thing to remember is that you don’t have to reach for goals alone. In fact, asking for help is easier now than ever before and there are always people ready to help. Even halfway across the world, people are ready to help. What have you failed at and was it money or time and effort that would have made the difference? When I am asked by small business owners how to improve their business I ask questions. The more questions I ask, the better I can see how their business operates. More importantly, the more questions they answer, the more they can see about their business. Often we put blinders on when we look at our business, employee’s performance, or customer service. Having a list of questions to answer about facets of your business can bring a clearer focus to what you think you know about things. The way to do that is to SWOT it. Have four sheets of paper ready to work on this exercise. The more you are able to write (even if you think it is not important) the more clearly you will see your business and the changes that you can make to have an immense impact on your success. What are the strengths of your business? This is also known as the elevator pitch. You should be able to give a clear description of what your business is about and why someone should work with you as opposed to a competitor in the time it takes an elevator to go from the lobby to the top floor of a building. Of course, you should have more bumpers sticker phrases to give all the strengths about your business. Starting with, “Why should I buy from you?” is a good focus for the first run-through on a SWOT analysis. Weaknesses are tougher to name. Both because you do not like to mention them, but also because you may not easily see them. Answer the question, “Why do people NOT buy from my business?” and you will have an uncomfortable list of things to fix. Opportunities are the part of your business that more often than not costs you in time, money, or effort. Be honest with yourself. Think, “If I had unlimited time, money, or manpower to make changes, what would I do?” The answers to where your opportunities are will show up on your list easily. Take your time and think back to when you were first starting your business. What vision did you have when you wrote your business plan? What do you need to change to bring that vision to life. Business Bulldog Rule #7 – Dream about where your business can go and then make it happen. Threats are easier to see, but no less tough to see on paper. Competition is the first on the list, but what about internally in your organization? Are there people on your staff who are not helping make your vision come to life? What about cash flow? Are you able to ride out this economy and still make payroll? Threats can come from every direction imaginable. Are you covered if someone gets hurt at your store? What if the street in front of your store closes down for a week or a month? What can you survive and grow despite? Bulldog Rules for Business were written using this format. Bulldog Rule #6 – Failing to plan for your day, week, month, and year is unacceptable is a good example of where this website came from. 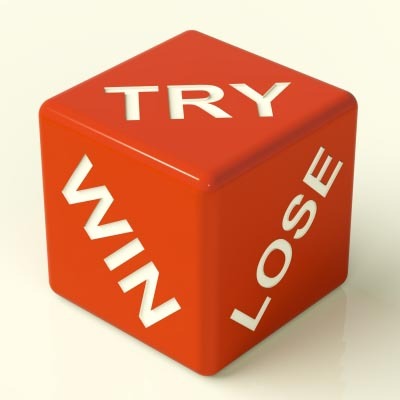 How about Bulldog Rule #8 – Re-examine your business often is what we are doing when we use the SWOT method. Even Bulldog Rule #12 – Be aware of your entire business is a SWOT in the right direction. 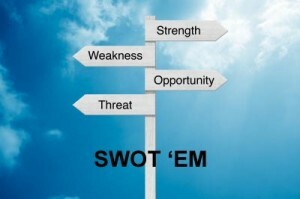 SWOT every business you can. Not only will you find interesting facts that can help make your business stronger, but you will be able to forecast when business opportunities become available before your competition. You can SWOT anything really. Your business is just one part of you day, so why shouldn’t you look at what else in your life takes time away from building your business. SWOT your business and then make the changes you need to grow, thrive, and build a business that exceeds your vision.